No need for a pledge drive this time: AMD has donated $200,000 to a Texas PBS station's initiative to help teenagers develop socially-conscious games. With all of the negative press out there in the mainstream media about videogames, it still comes as something of a surprise when you hear about a television station shining a light on the positive aspects of our hobby. Yet, one station in San Antonio, Texas is doing just that. The PBS affiliate, KLRN, has received a $200,000 grant from hardware manufacturer AMD to sponsor a program where children and teenagers develop games that address social issues ranging from poverty to climate change. As part of this program, children will create games using Whyville, a browser-based educational MMO that has been in operation since 1999. Throughout the development of these games, KLRN will film videos documenting the process and interviewing the creators about the myriad of social issues being addressed. The results will eventually be broadcast on the station and made available to other PBS affiliates around the United States. This initiative is being funded through AMD's Changing the Game program, which offers grants to schools and other organizations that assist children and teens in the creation of games that address current social issues like energy consumption, climate change, international conflicts, and hunger. According to Allyson Peerman, AMD Foundation President, the firm hopes that this program will attract teens - women especially - to videogame development. 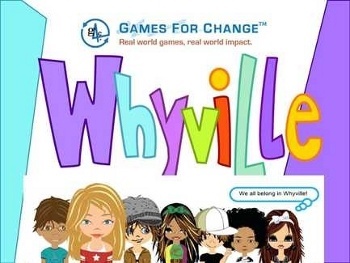 She noted, "This project will allow us to scale the reach of youth game development to millions of registered players in Whyville.net, and especially help us to reach and empower more young women, a key demographic in Whyville's virtual world." KLRN's project is scheduled to start next month, shortly after AMD opens up its "Game Pavilion" within Whyville's virtual world.